The rise of clean air zones in London and other British towns and cities has caused many fleet operators across the freight and passenger sectors to rethink their fleet replacement policies. Local authorities faced with air quality issues have been given a tool to deal with them by central government. That tool is the clean air zone: a relatively inflexible instrument that, when applied to heavy vehicles, allows the authority to impose tolls on trucks, coaches and buses that do not conform to Euro VI limits. Exceptions cannot be made, not even for vehicles certified to EEV – environmentally enhanced vehicle standard – that on introduction was seen as so stringent that only gas vehicles would ever be able to meet it. But it has since been eclipsed by the even more rigorous Euro VI limits for diesel. This move has had a distinct impact on the truck market, with used Euro V trucks changing hands at far lower prices than equivalent Euro VI models. While some might argue that this is nothing more than payback for those operators who brought buying decisions forward to secure cheaper – but more environmentally damaging – vehicles ahead of their competitors, the fact remains that operators with used Euro V vehicles now have a considerable financial hurdle to clear if they are to make the transition to Euro VI. On the other hand, with the last Euro V trucks having gone out of production some six or seven years ago, it’s not a problem that will afflict big fleets. But for other sectors, it’s more of an issue. Longer build times saw Euro V buses and coaches coming into service up to 12 months after the last Euro VI trucks were registered; and because of their high capital costs, such vehicles tend to have longer lives and stay longer with their first keeper, too. It’s by no means unusual for coach operators to get ten years out of a premium vehicle, gradually cascading it down the fleet pecking order from demanding work like continental tours and corporate hires to schools and similar contracts, with maybe a refurbishment and re-equipment to suit along the way. Similar arguments apply to specialist trucks such as refuse collection vehicles, and sewer jetters and tankers: the high value of their bodywork and limited resale market means that the first operator will tend to keep them from start to end of life, which, given their low mileage, may be a decade or more. There is a route by which a Euro V vehicle can have its emissions cleaned up to the extent that it will be acceptable in a CAZ, although it won’t have gone through the Euro VI certification process. This is the Clean Vehicle Retrofit Accreditation Scheme (CVRAS), which is supervised by the Energy Saving Trust and the Low Carbon Vehicle Partnership, and approves the fitting of retrofit kits that will get older vehicles up to an acceptable standard for operation in clean air zones (see table, below). This can be done either by installing additional selective catalytic reduction and particulate filtration capacity on the standard engine, or replacing the stock engine with a more modern unit. Other alternatives include fitting a replacement hybrid or all-electric driveline. Fitment of an approved kit does not necessarily get a vehicle to Euro VI standards. But it does mean that the output of NOx and PM have been measured in a simulation of type-specific operational cycles to ensure that its NOx and PM outputs are comparable. In some cases, they may even be better. The long service life and high capital cost of buses, together with the high proportion of such vehicles operating in current or future low emissions/clean air zones means the aftermarket sector has concentrated on this market first. Approval is by engine type rather than vehicle manufacturer, although there are different categories for single- and double-deckers. Refuse collection and other municipal vehicles are something of an anomaly. Although they are classed as trucks, their duty cycles (stop-start) and powertrains (fully automatic transmissions) are closer to buses than those of goods vehicles. They also share a long service life with buses and coaches. That, and the small number of chassis types, has made them attractive choices for some converters. Coaches represent a lucrative, and possibly under-served market. Many tourist destinations are within current or future clean air zones, and older coaches used for schools works will also need to access sensitive urban areas. So far, the only approved system for coaches is from Eminox, which offers a kit for the Volvo B9R chassis, powered by the Volvo D9B Euro V engine. There are currently no approved truck systems. Operators who wish to switch to a hybrid driveline or all-electric power have a number of options. Magnetic Systems Technology (Magtec) has approved repower kits for ADL Enviro 400 and 400H, Ayats Bravo City, Dennis Tridents, MAN Lion, Scania N94UD, Omnicity, and Citywide, and Volvo B7TL and B9TL, Wrightbus Eclipse Gemini and UNVI Urbis double-deckers. Approved single-decker conversions cover Dennis Dart, MAN Lion, Mercedes Citaro, Optare Metrocity, Solo, Tempo and Versa, Scania Citywide and Omnicity, and Wrightbus StreetLite. There is also a conversion available for the Mercedes Econic RCV. Vantage Power is working on a hybrid bus system for buses, using the latest Cummins ISBe 4.5-litre Euro VI C diesel engine. 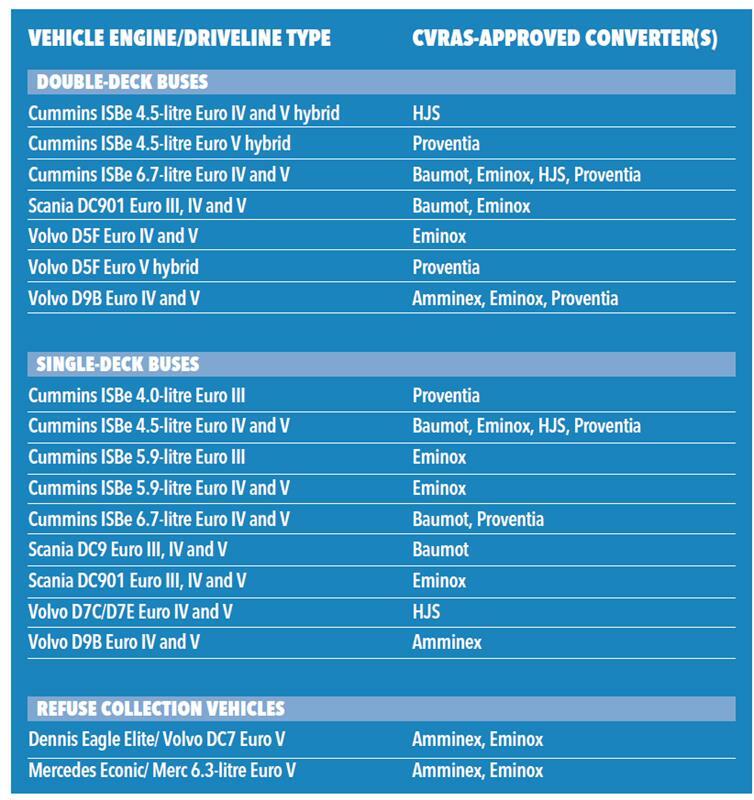 Cummins itself is developing a Euro VI repower package. Partner Millbrook Special Vehicles has retrofitted a Euro VI 4.5-litre diesel engine to a classic AEC Routemaster London bus.